Bring your ukulele - this jam is for all skill levels! The jam e﻿m﻿ph﻿asis ﻿is ﻿on ukulele - These jams are geared for beginner to advanced uke players, with an emphasis an keeping things simple so all can participate right from the beginning. Don't have a ukulele yet? We have some really nice ukulele loaners compliments of Kala Ukuleles and Groth Music. 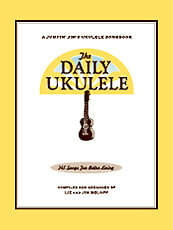 The Daily Ukulele features 365 well-known songs with easy ukulele arrangements in a easy to read format. All arrangements feature melody, lyrics and uke chord grids and are in ukulele-friendly keys that are particularly suited for groups. Includes favorites by The Beatles, Beach Boys and Bob Dylan, folk songs, pop songs, kids songs, Christmas carols and Broadway and Hollywood tunes, all with a spiral binding for easy usage. Also features a tips and techniques section, chord chart and vintage ukulele-themed photos and art throughout. The Daily Ukulele offers ukulele fun all year long! 336 pages. Available at Cadenza Music, ​Groth Music, Homestead Pickin' Parlor and Online at Flea Market Music.